Dr. Coe is a Board Certified Pediatric Dentist. She completed her undergraduate studies at San Tomas University in Colombia, South America, before completing three post graduate residency programs at Miami Valley Hospital of Ohio. During the next four years, she joined the Ohio State University dental program and completed a General Practice Residency. During one of these years, she was Chief Resident, and during two of these years, she completed a Pediatric Dental Fellowship at the Nationwide Children’s Hospital. Dr. Karen completed her Pediatric Dentistry residency program in Massachusetts with Lutheran Medical Center of New York. She is a member of the American Academy of Pediatric Dentistry, American Dental Association, and Texas Dental Association. 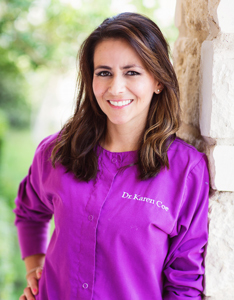 Read More About Karen Coe, D.D.S.